Renegade Preorders Open for Kids on Bikes Accessories! 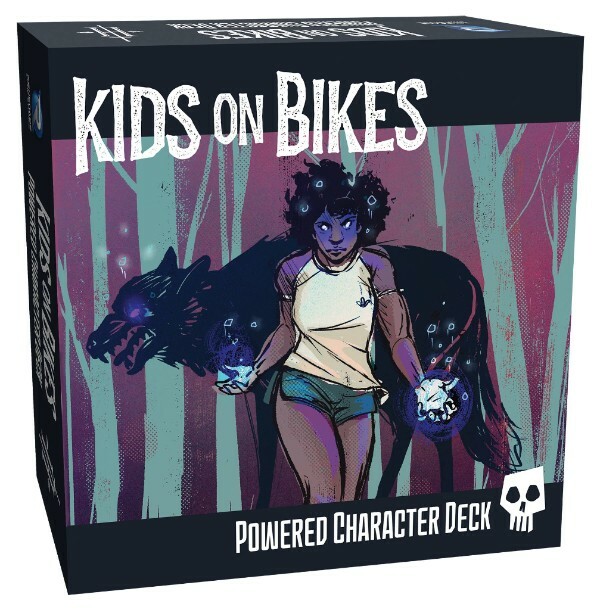 Renegade Game Studios™ and Hunters Entertainment have announced they are releasing two custom dice and a powered character deck to the upcoming roleplaying game, Kids on Bikes. The Core Book, Custom Dice, and Powered Character Deck are coming out next month and you can pre-order from your local game store or online through Renegade. The official Kids on Bikes Dice comes in a set of 7 and has the custom Kids on Bikes Logo on one side of each die. MSRP of $15.00. The Powered Character Deck gives players a shared character that they can control together. The deck comes with 100 Trait Cards to customize the Character. “Using aspects of the character from the GM, players will share narrative control over what the character does – and when they use their mysterious, dangerous powers! If you are attending Gen Con and would like to see Kids on Bikes in action, Renegade will be hosting sample modules of the game. Games will be running every day from 10am-12pm, 1pm-3pm, and 4pm-6pm in the Event Hall. Unfortunately all of the games are sold out, but you can still hang out and watch to get a feel for the system.